Stop Coddling the Super-Rich – NYTimes.com. Warren Buffett has done the best he can do. He consistently shouts out a version of, ” This isn’t fair. This system is bad for America. The super-rich don’t deserve this on the backs of the middle class. Stop It …” His latest is “Stop Codding the Super-Rich” in the New York Times. It’s chock-full of the ways the tax code is used to give ridiculous breaks to the super wealthy and leave the financial heavy lifting to those who are least able to afford it. In prior articles, Buffett has talked about how his federal tax payment, by percentage, is less than the middle class admin assistants and others who work around him. It’s really a travesty–and the sad thing is that this burden on the middle class is one of the causes, not a result of, the recession and economic downturn that is impacting the US (see prior post). A number of other super-wealthy have said similar things, including the Bill Gates Sr, who was roundly criticized. And as Buffett points out, the best US economy and job growth in modern time was in the 90’s, when tax policy was more fairly distributed across wealth lines. Warren Buffet has nothing to gain when he keeps “beating the drum” for a fair tax policy. 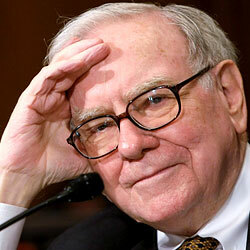 Buffett is a brilliant older man who wants to ensure the the country continues to be strong and fair. And by doing the right thing here, we can start to get our economy back in line and our country back to work. I’m going to become an advocate for what I’m terming “The Buffett Solution.” I hope you’ll join me in this, because we can change this ugly mess we’re in but we HAVE TO SPEAK UP. Please add your comments, thoughts and ideas to Twitter, Facebook and your blogs demanding that Congress embrace the wisdom and suggested policy put forth by Warren Buffet, with The Buffett Solution, or we’ll work to hound them out of leadership. It’s time for the rest of us to act. Categories: The Buffett Approach, The Economy | Tags: huffington post, politics, taxes, The Buffett Solution, the economy, the middle class | Permalink.